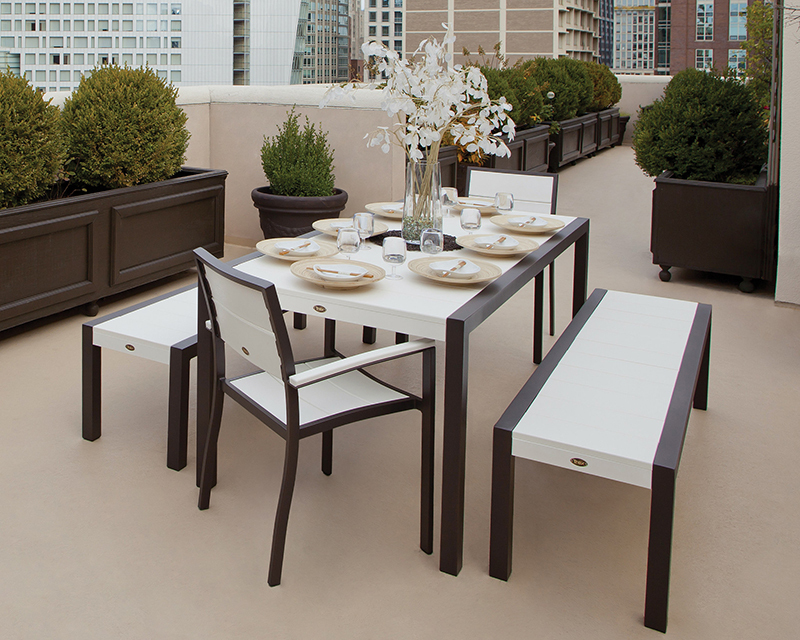 The beauty of your outdoor space is the blank canvas it provides. You don’t have to rip out ugly paneling or lament that nubby blue carpet. Instead, let nature be your guide. Remember when everything was dark woods, jewel tones, and just all-around heavy? These days, streamlined, clean, and simple are the new outdoor neutrals. Think clean lines, simple patterns, and unfussy accessories to make a space feel more airy. 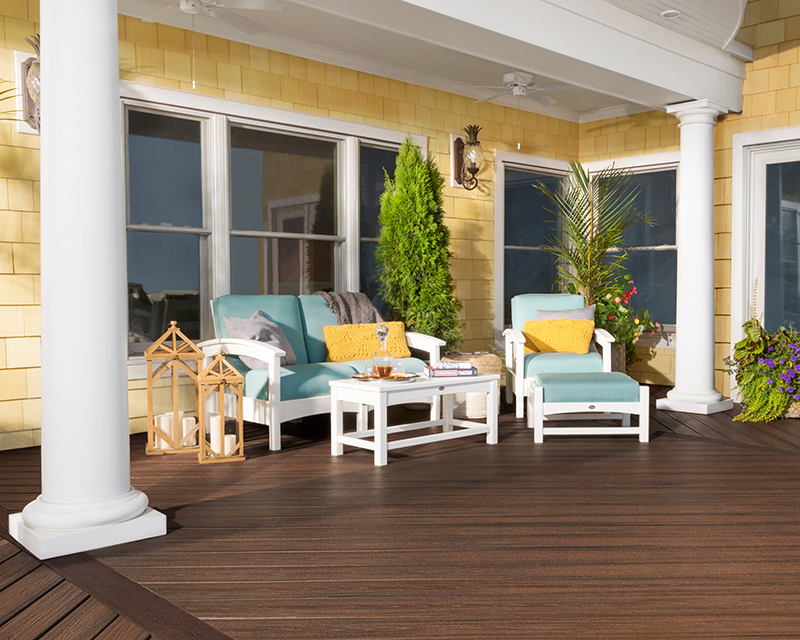 Check out Trex Furniture’s Surf City Collection to help you achieve the modern look. Who says you need to match things? Sure, it’s nice to buy a five-piece outdoor dining set, but why not add a different-style settee in the other corner of your patio? Those antique rockers that you recently refinished after a trip to the flea market? Or how about some wrought-iron plant stands? Mix old and new together to infuse character into any space. 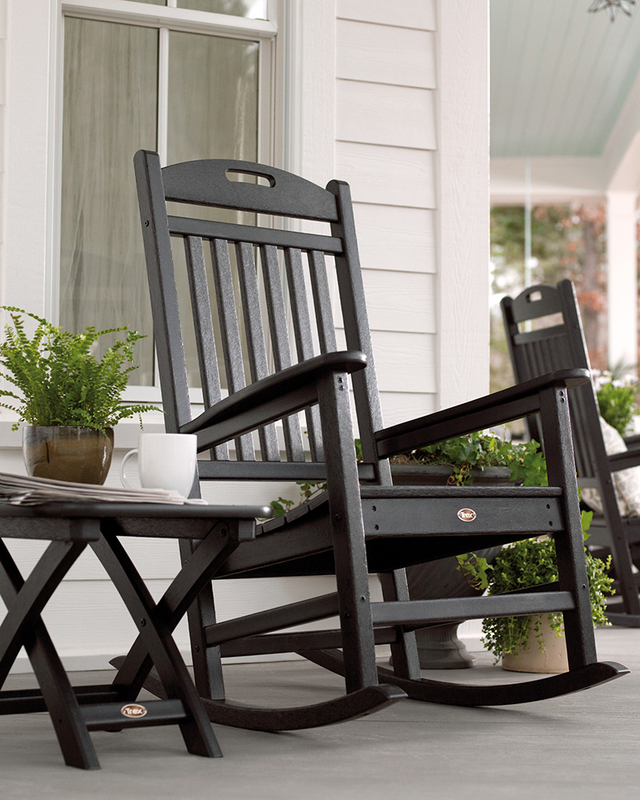 Try mixing the Rockport Collection with items already in your home, like cozy porch shown below. And speaking of mixing things up, don’t be afraid to add in pops of color or hints of metal. A bright yellow coffee table, a gilded garden bench, or a copper fountain also add visual interest while warming up a space. Industrial design is all the rage this year, too, so consider incorporating some distressed woods, a pallet-built side table, or a natural wood bar on casters for an eclectic feel. 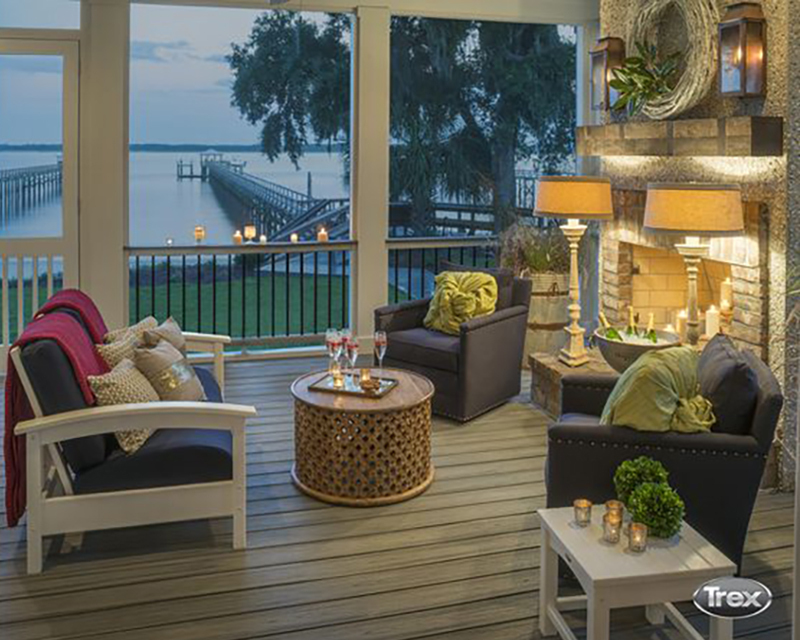 Think of your outdoor space as a room and create functional “comfort zones” throughout. If you have a nice swath of green grass and trees, add a cozy hammock in one corner, create a conversational grouping of Adirondack chairs around a fire pit in the center of your yard (DIY Fire Pit), and save the covered patio for your dining set and grill. Adding these cozy touches makes your yard more inviting. Don’t have any backyard real estate? No problem! Plop down some rockers and a side table on your front porch, or add a zero-gravity recliner and a nice plant to your apartment balcony, and you’re in business. The smaller the space, the easier it is to make it feel cozy. All it really takes is a nice rocker, side table and decorative accessories. Gray, beige, white, and black are beautiful … but so are vibrant infusions of color. If you’re gun-shy about teal or cherry-red deck chairs, start smaller. Sunbrella® cushions and pillows come in lively fabrics, patterns, and styles. Add poppy-hued pillows to your white porch swing. Continue to add in color with outdoor rugs, umbrellas, and, of course, flowers and greenery. Try coordinating with the colors of your house to make an eye-catching scene like the one below featuring our Rockport Collection where you can pick the cushion color that best suits your space and add pillows and throws to add details and that extra pop of color. You don’t really want to spend all your time carefully sculpting hedges or pulling weeds in the flowerbed! Think low, low maintenance planting. 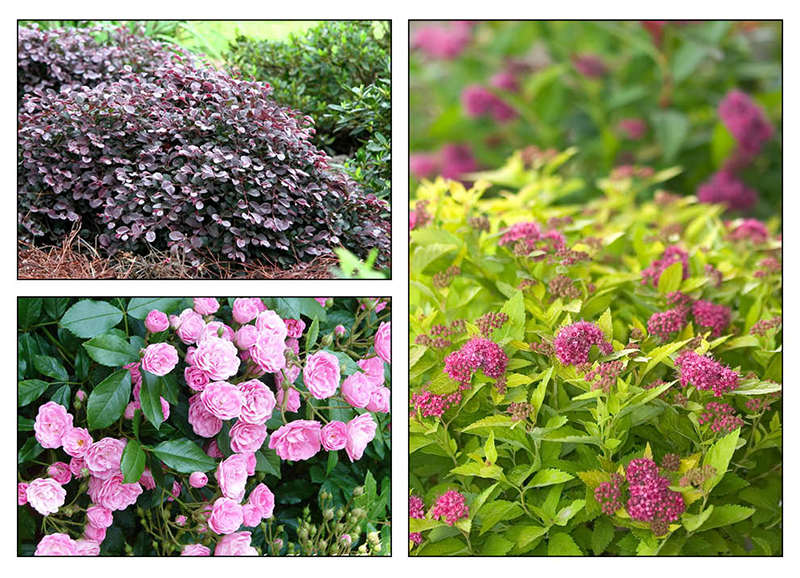 We love slow-growing shrubs and plants that don’t need constant care or shaping, and that can grow organically over time. Our current favorites that grow easily (depending, of course, on your growing zone) and require little in the way of maintaining include purple-red loropetalum, gold spirea, fragrant tea olive trees, and bright knockout roses. If you want to go even less maintenance, select native plants to attract birds, wildlife, and insects (the good kinds!) to your yard. Bonus: It’s environmentally friendly, easy to maintain, and beautiful. You’ll have to check with your local landscape or nursery expert for plants native to your area or appropriate for your growing zone. Live out all your “Top Chef” dreams with state-of-the-art outdoor kitchen space. While outdoor kitchens have been around for a while, they’re getting ever more elaborate with the rise of outdoor entertaining. Think full-fledged kitchen spaces with fridges (or wine fridges! ), smokers, pizza ovens, and drawers full of all the outdoor tools and appliances you (do or don’t) need to master the art of grilling. Because, at our most primal, we’re drawn to the simple pleasures—the cool night air, the soft buzz of insects … and fire, we love the addition of some sort of fiery element in the yard. 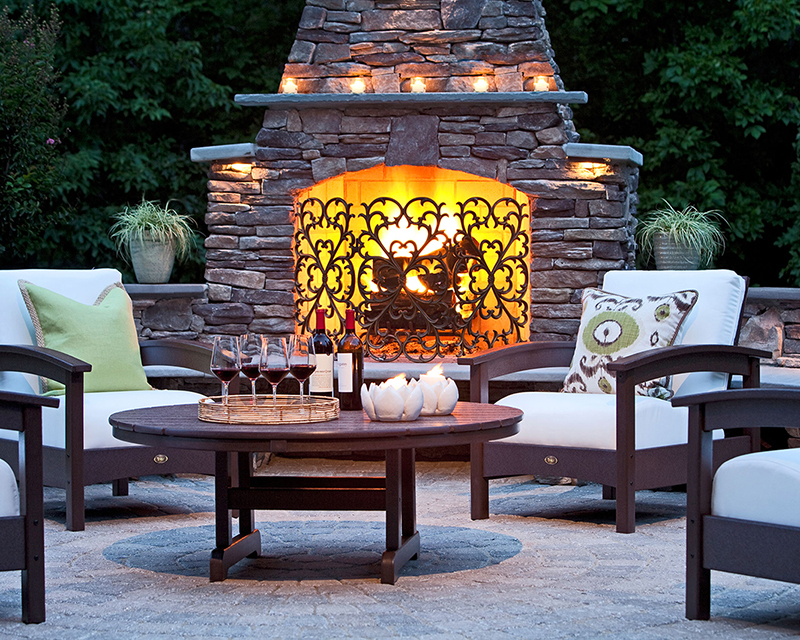 Whether it’s a gathering of candles on an outdoor dining table, tiki torches around your deck’s perimeter to ward of mosquitoes, or a homemade fire pit, fire is just … hot. It adds warmth and ambiance … and the smell of woodsmoke doesn’t hurt either. 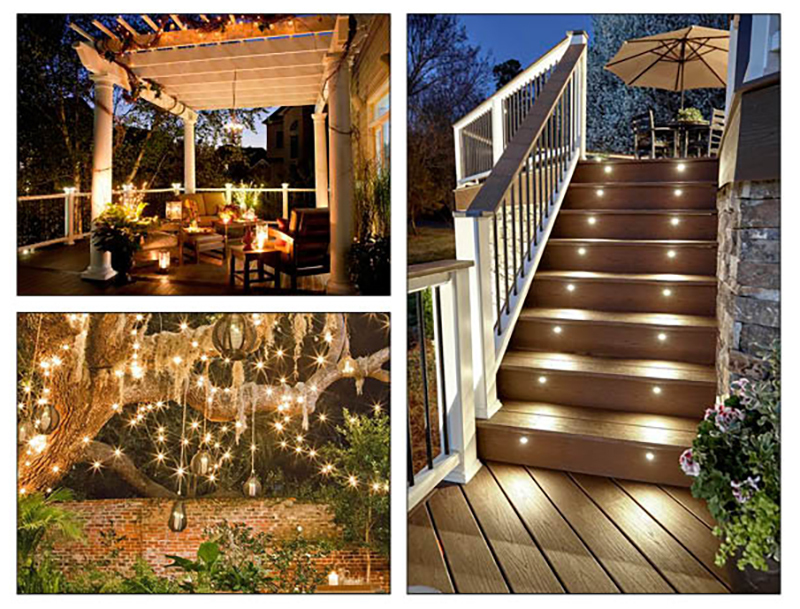 Add in functional lighting features like twinkling landscape lights, lanterns, and statement lights to really draw focus to your garden, walkway, or outdoor living areas. Think an iron chandelier suspended over a dining table, task lighting set on side tables, or even dimmable LED lighting on railing and stairs. 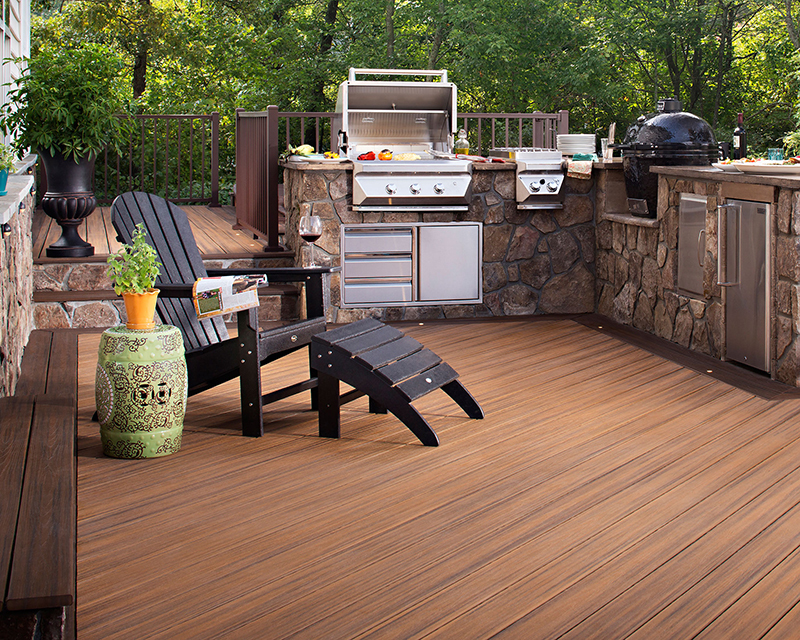 Plus, they enhance safety, security … and extend the time you spend enjoying outdoor living. 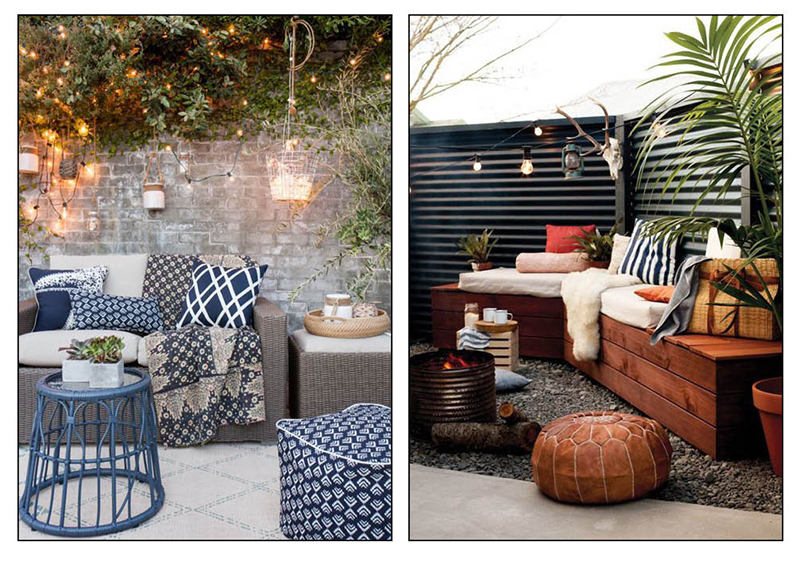 Which of these hot design trends have you incorporated into your outdoor space? Tell us here, or show us a picture of your backyard!